The battery drain issue has stumped users for weeks, with lots of people offering advice but no tried-and-true fixes. Apple acknowledged the battery problem last week, and promised a software update "in a few weeks." The update also is supposed to fix a security glitch that allowed anyone to bypass the iPad 2's lock screen and password protection using only a Smart Cover. This exploit provided access to the home screen or the currently open app, along with the iPad's search function. 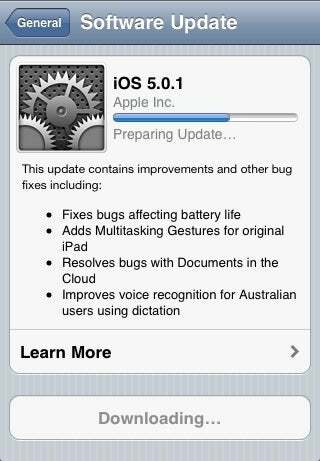 The software update also includes improvements to voice recognition for Australian users and resolves bugs with Documents in the Cloud. But iOS 5.0.1 isn't all about squashing bugs. It also adds multitouch navigation gestures for the original iPad. Users can now swipe up with four or five fingers to open the multitasking menu, swipe left or right to move between open apps, and pinch to return to the home screen. To activate these gestures, go to the "General" section in Settings, and look for the "Multitasking Gestures" option. As the first software update since the launch of iOS 5, this was also Apple's first opportunity to try over-the-air updates. Users can check for the update by going to the "General" section in Settings, then tapping on "Software Update." A listing for the new version should appear. Apple recommends connecting to a power source to conserve battery, but it's not required.